Have you ever seen an antelope wearing a radio collar and sporting a red ear tag? We never had until we spotted this guy in Nine Mile Canyon. We'll be taking a blogging break to spend time with family for the next couple of weeks. The search for petroglyphs can be precarious. Literally. The cliff to Steve's right (above) is about 100 feet straight down. He calls this ledge a "sidewalk". I wasn't nearly as relaxed about walking on it. Their choice was logical, though. The height gave them a good view in all accessible directions. If enemies attacked, the pit house dwellers would have had plenty of warning. Should we get out our climbing gear? Does anyone have a helicopter? Today, Nine Mile Canyon is famous for its many impressive panels of ancient rock art, but in the 1880's, the canyon was best known for being on the supply route from the Price, Utah train station to the Uinta Basin (by way of Gate Canyon). 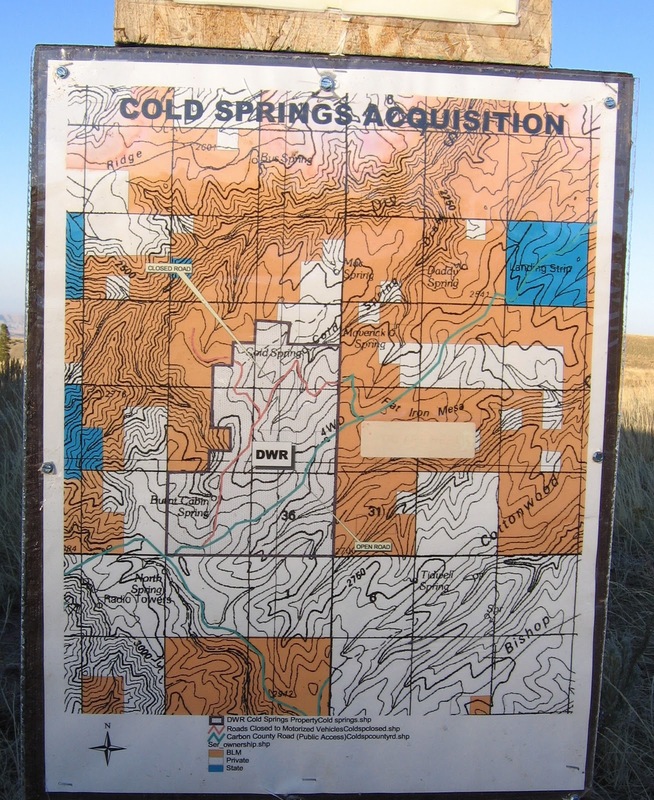 Although Native American trails undoubtedly existed in the canyon for at least 1000 years, the army built the first formal wagon road to bring supplies to Fort Duchesne, a military installation opened in 1886 to "control" the Utes who had recently been moved to a reservation in the Uinta Basin area. There is no door, so perhaps the "open" sign was redundant. One can imagine thirsty stagecoach travelers and freight wagon drivers stopping by for a drink. The old saloon and lodging house were built on the William Brock Ranch. Brock was one of the first ranchers to settle in Nine Mile, but his ranching days ended when he killed a man and had to hotfoot it out of the country. A man named Pete Francis took over the saloon, but he didn't last long, either. He was killed in a brawl in his own saloon. In 1902, Francis's widow sold the property to Preston Nutter, who made the Nine Mile Canyon ranch his home as well as the headquarters for his extensive cattle operations all over Utah, Colorado, and Arizona. The ranch remained in the Nutter family until the '60's and is still known as the Preston Nutter Ranch. 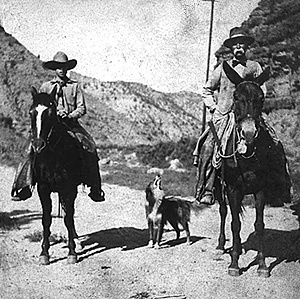 Stories abound of outlaws such as Butch Cassidy traveling through Nine Mile Canyon on their way from Robber's Roost in southern Utah, to Brown's Park, a favorite outlaw hangout in NE Utah near the borders of Wyoming and Colorado. So, in addition to viewing great Fremont/Anasazi rock art, you can revisit the old wild west during your trip to Nine Mile Canyon. Nine Mile Creek begins as a trickle running off of the West Tavaputs Plateau and travels through a deep canyon to the Green River. The canyon is known for its amazing quantity and variation of ancient Native American rock art. We toured the section of Nine Mile beginning at the junction with Gate Canyon and going toward Argyle Canyon. In 3 hours of scouting with binoculars, climbing the cliffy hillsides for better views, and taking photos of the numerous petroglyphs and occasional pictographs on many rock panels, we only managed to cover 3.5 miles. Do you see a Mardi Gras mask here? The tree-like figure above is thought to represent a corn plant. Were the ancients into matrix math? Did space aliens visit this culture? Paradoxically, Nine Mile Canyon twists and turns for more than 50 miles on its way to the Green River. The name Nine Mile seems to have come from the John Wesley Powell Expeditions, 1868-1871, possibly given to the canyon because of the 9 miles between it and Desolation Canyon. There are other theories on the name, but none that make as much sense. Nine Mile Canyon can be reached via the Nine Mile Canyon road from Wellington, Utah, or via the Wells Draw Road from Duchesne, Utah. As we explored the mesa above Nine Mile Canyon before our descent, we noticed an unusual triangle of rocks. Can you imagine how much geologic force was required to disrupt those sedimentary layers? The reptiles had moved into winter quarters on this cold November day. We completed our trek with an hour to spare before sunset. We've traveled into Nine Mile Canyon from several directions, but this time we wanted to approach the roadless part of this canyon, in the last five miles before Nine Mile Creek reaches its confluence with Green River. We began our hike from a mesa top on the north (Bad Land Cliffs) side. On the left and right of the photo above, you can see a 50-100 foot cliff. That same cliff extends all along the rim, seriously limiting access. We found one slight break in the cliff, enough to provide a way down. I've marked our starting point with a green V in the photo above. The broken rocks were almost like stair steps down the cliffy area. But she did, once she saw she had no other choice. Do I look shell-shocked as I negotiate a tiny path above a 100 foot cliff? We ran short on daylight and didn't have much time to explore, but we did see some interesting rock formations. I'll show some of those next time. They say these boots are made for walking. As soon as my legs are long enough to stomp right on over to you! Several of you asked about sightings of wild horses on Wild Horse Bench. We didn't see any there, but we saw the mustang herd pictured above in 2005, on the other side of the Green River in the Book Cliffs (about 20 miles distant, as the crow flies). 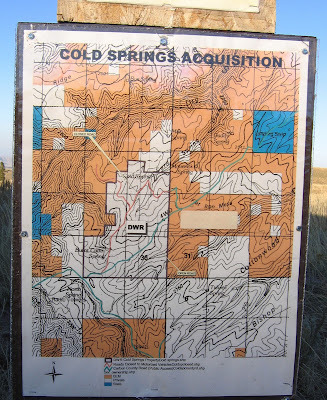 We reached Cold Springs by driving through Nine Mile Canyon to Cottonwood Canyon, then traveling some obscure dirt roads to a plateau. We hiked to the spring and saw the horses as we were returning to our truck. Their curiosity held them long enough for a couple of photos before they took off. It's remote and beautiful wild country. Definitely worth the trip.